With their 2 strikers, so would we. Dreadful error from Foster but what spirit and desire we showed,we deserved a point. Daft of Deeney but that's how he plays,on the edge. I doubt if Kane or another big side player had done it the result would have been the same.Infact, if I think back to ManCity v Spurs last season, Kane and Ali could both have been sent off,oh what's the use! My mood has not been helped by the A414 being shut,meaning a half hour delay. Chinless wonder Arsenal fans will no doubt re appear from their troglodyte living to gloat. Memories of Wilf at The Kennel with Paul Elliot spring to mind tonight. According the Adam Leventhal, Watford will be appealing the red card decision. But it's not nonsense though, is it? The ball was well, well gone and Troy decided to rough him up a bit. It's probably not a red but he didn't need to do it at all, it's not like he was stopping an attack or going too hard in a 50-50. Being a bit late and a bit silly doesn’t equate to violent conduct, though; it’s almost nothing. The pusillanimous FA won’t overturn it in a month of Sundays, of course. Pawson’s first half performance was quite simply execrable. I agree with most of what you have said, however I cannot agree about Doucoure. You are not the only one who has praised him to the hilt today and nearly every week a lot of you do the same. He does OK for us, but this season he is being overrated week in week out IMO. Am I the only one that thinks his passing is abysmal at the moment? Although he wins a lot of the ball in MF, he loses it almost as much or makes a terrible pass after winning it. He was fantastic last season, but this season he has been distinctly average and not the god most of our fans and media outlets claim he is. If he could get back to the player he was last year I would hope he stays, but if he were to continue to play as he has this season I would not be too disappointed if he left as many are saying he will. Pawson’s first half performance was quite simply excreable. I agree that the FA will not overturn this. One of the reasons is Deeney's big mouth with his “Let me whack the first one and see who wants it” comment. The FA will take delight in teaching him a lesson. Will he learn?......not a bit of it...….but being so outspoken he has to accept the other side of the coin. The establishment don't like it and will crack down on it whenever they get the opportunity. I've never seen the advantage in saying "the truth" when it's detrimental to the opposition. There will always be another day, and they will always use it against you as motivation. I've never understood why Deeney gives this type of interview as he must know, somewhere down the line it will bite him. Tonight was the night. Happy bunny, Burnsy, miked2006 and 3 others like this. Jlappy, Knight GT, folkestone orn and 7 others like this. If you watch the game again , about 30 seconds or a minute or so before the goal Gray is blatantly fouled, he’s held, pulled back and swung around! That annoyed me. Where's Wally, Happy bunny, W4BS and 10 others like this. Yes, agree with this. A bit too fond of his own hype and in need of a quiet word, if he’d pay any attention. Still a crap decision - where’s the sanction against the fakers? Happy bunny, wimbornet and foxywfc like this. That was a joke of a dive! Which Deeney saw and probably riled him up a little bit. Happy bunny and Norwayhornet like this. I agree with most of what you have said, however, I cannot agree about Doucoure. Started the season slowly and I was the first to criticise him but he is utterly indispensable to this team right now. I think we're just used to him. 1) His lungs, his ball recoveries and all these things that aren't always quantified allow us to play how we do. 2) 5 goals and 6 assists from midfield is very good. 3) I believe he makes Capoue better. 4) Opposition fans nearly always pick him out as our best player. That can't be a coincidence. 5) Do you remember how poor we were in that little stretch where he was injured? He's not immune from criticism and right now he'd be behind Holebas, Foster, Capoue and maybe even Cathcart for POTS but he's the first name on the team sheet for me. luke_golden, EB Hornet, Siohmy and 3 others like this. I called that too on the half way line by one of Arsenal’s centre backs. ? But that was typical of how the game was going with the refs decisions. Messina in the corner hardly touched Xhaka then someone else got away with something. Really annoyed after that match. We have deserved points from a few games agaist the so-called top 6 and come away with nothing. But if we keep these performances up we will hopefully get our rewards as long as the opposition don’t have a 12th man every game. A fine performance from Watford, especially the midfield; Janmaat played like a man possessed and Masina did a great impersonation of Holebas. However, without Deeney or Deulofeu on the pitch the quality up front was lacking. It’s an area that still needs to be addressed, despite this season’s successes. Meanwhile, how on earth are Arsenal in the top six, let alone the top four? Happy bunny, EB Hornet, I Blame Bassett and 1 other person like this. I don't think we'd win an appeal but from that angle you can see Torreira had a hold of Deeney. You could argue that Deeney was just trying to push him off and would have connected to the chest of a taller person. Assuming you mean the hand on Troy's shorts? I don't think he's holding on there. Troy definitely made contact with Torriera first. He came on with only 7mins to play and i know he didn’t get too many touches on the ball, but being fresh legged id expect him to be chasing down their players and he didnt do that. I sometimes wonder if playing janmaat and kiko makes us stronger than playing pereyra. I'm nervous that janmaat will leave us in the summer. Brilliant player and always has a goal in him. He'd be really hard to replace. Blaming him for the goal is ridiculous. Any keeper needs to be able to deal with situations like that. It just highlights my point about why keepers should never ever be POTS over an outfield player: they are useless with the ball at their feet. You know, at FOOTball. Foster mouthed "I'm really sorry" to the family stand when he went to get the ball for a goal kick about 5 minutes after the goal. He looked furious with himself for the whole game. Think he might just have handed Holebas player of the season. Someone pointed out the foul on Gray in the build up to it - I have no idea how it wasn't given after he was thrown to the floor. On the plus side, we didn't have any plastic Arsenal fans sat near us this time. They were definitely the quietest traveling support we've had all season. In a performance where we had many stand-out players, I thought Daryl Janmaat was excellent. I saw some of the highlights after I got home, including Gary Neville (whom I rate as a pundit) showing that as the ball wasn't in play when their keeper pushed Gray over, he therefore he couldn't be penalised. Is that right ? If so, how come players are sometimes booked / sent off after a game ? If Neville is right, does that mean that a player can headbutt another player and no action would be taken if the ball is out of play at the time ? Surely not ? Cards can still be given. It's just a free kick / penalty can't be awarded. Ah. Thank you. I wonder why the 'keeper wasn't carded. Once again a "smaller" team gets no rub of the green from the ref. If Deeney had gone in to elbow Torriera he'd have been in hospital. No blood, no bruise, no injury at all. Same with a number of Arsenal ballerinas sprawling over the floor all game. Their gameplan was to get the ref to give them fouls against nasty watford and it worked. Which is lucky for Arsenal because they were ABYSMAL otherwise. Theres a point where the game will be done for me, by VAR stoppages, bias refs, minute touches being given as fouls and penalties, the idea of being entitled to go down, the rolling on the floor, the waving of imaginary cards, having the nous to draw a foul, Wilf Zaha, pundits saying things like "in 2019 you can't make a tackle". For Arsenal, they're already there. The way they played last night was embarrassing on more than one level, the frustration is that to counter it, you have to join it. The positive was that there's so much to like in this watford team. We have talent even without GD and RP and we have a heart to go with it. I think Chelsea or similar might come in for Gracia soon and I think he'll turn them down. Tilting at Windmills, WillisWasTheWorst, folkestone orn and 2 others like this. 1 win & 10 losses seems a poor return from our top 6 matches this season. The worst under Pozzo. Six, I think, have been lost by a single goal & in some (@rsenal & Man U away) we have dominated. They are better than us ? Last time we ditched Z cars was under the Bald Italian if I recall correctly. That also went well. Bwood_Horn and Happy bunny like this. Wolves have taken many points from these games, as have we in previous seasons. I didn't think Success was that bad, he created two good chances for Gray who fluffed his lines. Such a shame we shot ourselves in the foot last night as Arsenal were poor. Funny how people see things differently, because I thought Gray was immense. Sure not every touch was perfect, but even Drogba in his pomp would overrun the odd ball. Gray was foiled by good defending and pure bad luck. He did as well as 99% of premier league strikers could or would IMO. As for Hughes, he was my MoTM. He looked world class yesterday in a more suitable role for him. Pulling strings and often acting as the support forward. Heading is never his strong suit but he got on the end of one that could have been our precious equaliser. EB Hornet and kVA like this. I understand your point about Doucoure losing the ball and misplaced passing but I think you've answered it by saying "he wins a lot of the ball". It is his industry,his energy and verve that we will miss. He is the heartbeat of the team,he sets the tempo and drives us forward.He never shirks or hides and is involved so much he is certain to make mistakes. Someone said Hughes could play there and I think that's a good shout as he is a better footballer than Doucoure,indeed better than a large majority. Can he sustain the work rate? Yes I think he can but as Doris says "we'll have to wait and see"! I'm proud of the team today. One thing that came out of yesterday was that Kiko and Janmaat in tandem could be a better answer down the right. Both can tuck in and both can get forwards, though Janmaat more with sheer brick wall shattering determination than pace. What was and is lacking from both of them, is final ball, which was starkly apparent yesterday, though they were not helped by having a lone and well marked Gray as the only target. Put Deeney in that box as well, dragging two defenders and have Doucoure bombing in with Hughes and the law of averages says at least 2 of our attacks yesterday had a more positive outcome. foxywfc, Happy bunny and The Voice of Reason like this. Personally I think it's a no brainer to appeal. I thought it was 100% not a red, but in these days if armchair experts, the "I've seen them given" and "his arms are up he's got to go" narratives from people who clearly don't know the laws of the game have already been written. 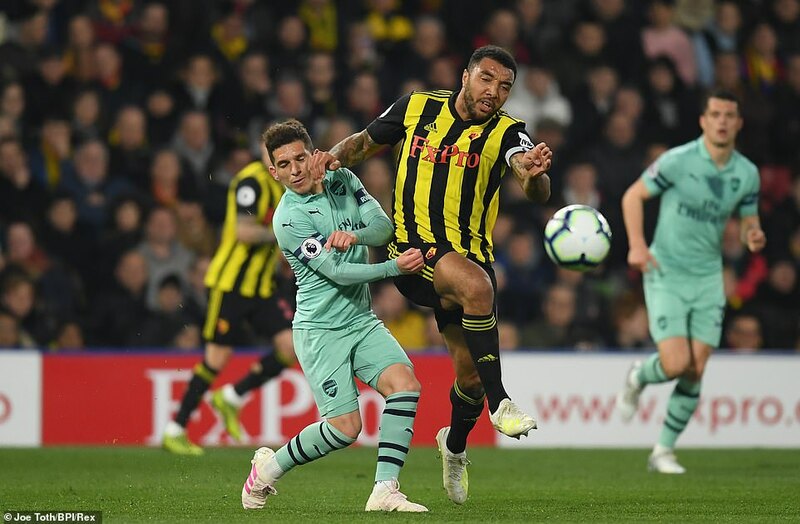 To any of the people who are saying "I think the ref has got it right," (not so much on here, but more widely on social media) I'd want to know, if the ref had completely ignored/missed it, would there be an outcry for retrospective action against deeney? Would you have called for a red on kane, or Hazzard for that? Would you accept it if your player received it? I'm sick to death of the big game, sky sports media deciding what is and isn't fair, even when presented with replays, but still coming up completely wrong. This is why VAR won't do more than slightly untip the balance by about 2%, because pundits can watch that and see it as a red, but would be up in arms if it had been Aguero or Lukako, where it would 100% be overturned, even though the ref wouldn't have had the stones to award it in the first place. Tilting at Windmills, Forzainglese, I Blame Bassett and 2 others like this.